Lulu eGames is the annual startup competition sponsored by Lulu.com, the online print-on-demand, self-publishing and distribution platform. 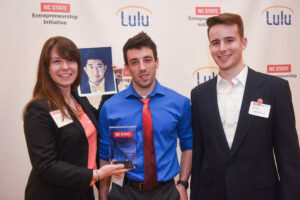 The competition is divided into five tracks in which NC State University students can enter and compete for more than $60,000 in prizes. The tracks are: New Venture, Design and Prototype, Arts Feasibility Study, Daugherty Endowment, and B Corp Champions. The Awards Ceremony and Entrepreneurs Expo was held on April 14 and offered the opportunity to learn about each of the winning entries. Twenty-three finalists in the five categories competed for first, second, third place, and judge’s choice categories. 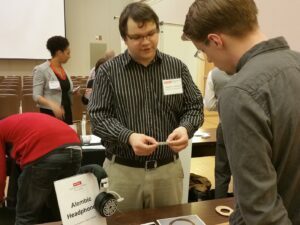 In addition, each entry had the opportunity to showcase their product video for a separate competition worth $500 for the winning entry in each category. Winning teams in each category delivered a three-minute pitch to the audience who then chose a final winner to receive additional prize money. After each pitch, audience members sent questions via Twitter for the contestants to answer. 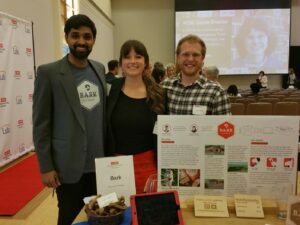 Three College of Design students were finalists with four unique entries in three different categories. Two of the students received judge’s choice awards, and also won second and third prize in their specific category. SuperViZE is a group monitoring system that’s been optimized for the caretakers of larger groups of children that triangulates their relative locations for chaperones to view at any time and conduct automated roll calls. Existing child tracking devices are too slow, complex to use, or only effective for 2 to 3 children, so we’ve designed our device to not only be simple to use and quick to setup, but it also utilizes a standard electromagnetic lock that’s so secure, even an adult would have difficulty removing it. If little Lucy wanders out of safe range, Lucy and her chaperone’s devices will beep to alert them. Now that you can efficiently monitor all your children at once, you can waste less time stressing out and put more focus on doing your job well, effectively lowering risk and improving the quality of your care. Finally… some peace of mind! PÜRE is a product design and development initiative that consists of North Carolina State University graduate-level students. The team, currently operating out of Raleigh, consists of two high performing Jenkins MBA candidates with backgrounds in Sales and Supply Chain Management and a world-class Industrial Designer & Design Strategist. The Vision for PÜRE is to be the first smart coffee roaster, grinder, and brewer available today. In-home coffee roasters have been around for years, but the knowledge to operate them has been reserved for true coffee aficionados. The PÜRE product was created for the everyday coffee drinker who wants to up the flavor of their brew while drastically lowering their costs. It’s easy enough for anyone to use. Just take one of the green bean packages, scan it against the PÜRE logo, and select your roast preference. Once you hit the “PÜRE” button, the machine takes care of the rest, giving customers the freshest cup of coffee ever tasted. 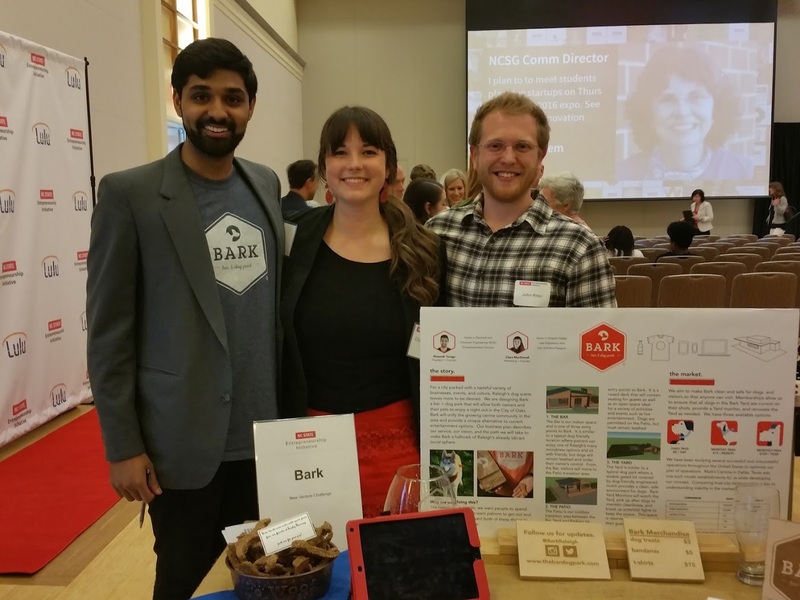 Bark : Working with the Entrepreneurship Clinic at HQ Raleigh, Bark teammates identified new business ideas with high potential in Raleigh. They found that for Raleigh’s nearly 200,000 dog owners, finding a place to grab a drink with our furry friends can be a struggle, as zero dog-friendly, off-leash restaurants or bars are available. Bark is going to be more than just another dog-friendly spot, it is going to be Raleigh’s first bar complete with indoor and outdoor spaces for dogs to run around, interact, and enjoy themselves off-leash. The team aims to provide an outlet for dog owners who want to have a more active social life without leaving their pets behind while also plugging into the strong dog community already present in Raleigh. The Alembic Headphone venture is a set of headphones which allows the consumer to easily customize many of the aspects of sound and appearance. The back of each headphone cup is attached magnetically and can be replaced with different wood materials to allow the user to tune the sound for various purposes. The headband is also magnetically attached and can be swapped out. The set is constructed primarily from wood and metal with plans for aluminum options and a variety of wood types. The drivers used in the project are fairly unique in the audio world, having a planar magnetic form and made in-house using neodymium magnets and PEEK film. After the eGames, Waddell is hoping to continue developing the set’s design and opening an online storefront for the headphones.